So what caused the Bronze Age Collapse? Greek gods threw a party and forgot to invite the goddess of Discord. Volcanic eruption => famines => migration. Chariots, iron, and swords that hack. We are all familiar, of course, with the Homeric (and Vergilian) version of the Greek assault on Troy. Though Homer does not actually detail the war’s initial causes, nor its end, these parts of the tale are famous enough in their own right. By the time Homer composed his epics, the assault on Troy had fallen into the realm of legend; for the next 3,000 years, myths of the “golden age” of the late Greek Bronze Age dominated European art and culture. Formerly under the Hittites, the Assuwa confederation defected after the battle of Kadesh between Egypt and the Hittites (ca. 1274 BC). In 1230 BC Hittite king Tudhaliya IV (ca. 1240–1210 BC) campaigned against this federation. Under Arnuwanda III (ca. 1210–1205 BC) the Hittites were forced to abandon the lands they controlled in the coast of the Aegean. It is possible that the Trojan War was a conflict between the king of Ahhiyawa and the Assuwa confederation. 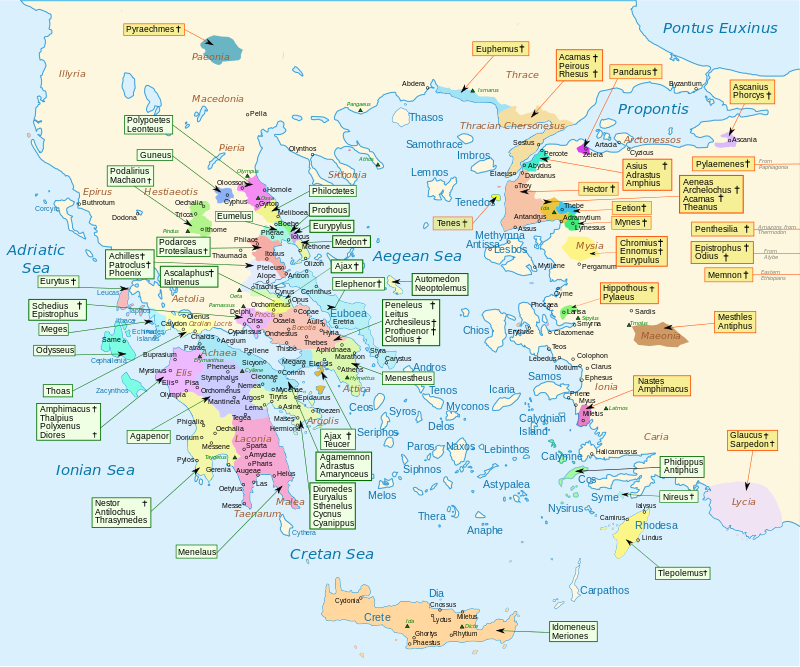 This view has been supported in that the entire war includes the landing in Mysia (and Telephus’ wounding), Achilles’s campaigns in the North Aegean and Telamonian Ajax’s campaigns in Thrace and Phrygia. Most of these regions were part of Assuwa. It has also been noted that there is great similarity between the names of the Sea Peoples, which at that time were raiding Egypt, as they are listed by Ramesses III and Merneptah, and of the allies of the Trojans. Now someone needs to find a reference to Helen. 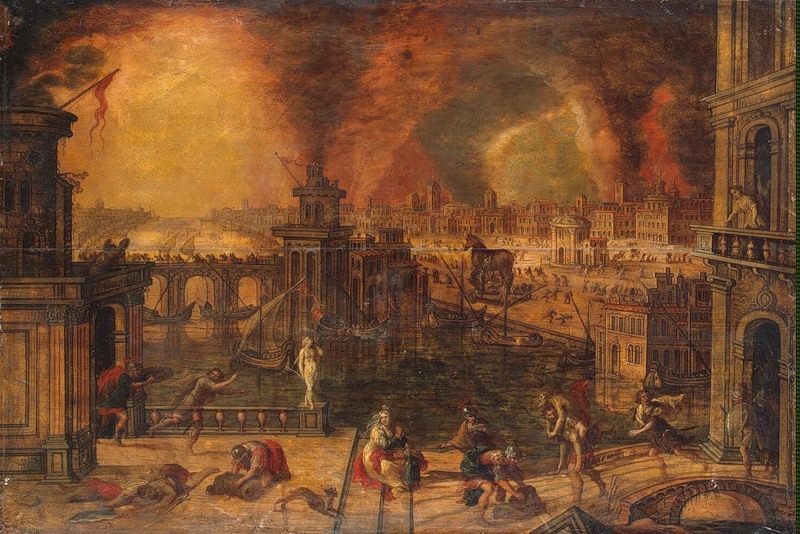 That said, the historical sack of Troy was a much smaller even than Homer recounts, and is certainly inadequate to explain the large-scale collapse that consumed the entire region (and possibly a good chunk of northern Europe, as well. A volcanic winter from an eruption in the late 17th century BCE has been claimed by some researchers to correlate with entries in Chinese records documenting the collapse of the Xia dynasty in China. According to the Bamboo Annals, the collapse of the dynasty and the rise of the Shang dynasty, approximately dated to 1618 BCE, were accompanied by “yellow fog, a dim sun, then three suns, frost in July, famine, and the withering of all five cereals”. The downside to the Thera Theory is that even if we use the latest dates, it’s still too early–by 2 or 300 years–to explain the Bronze Age Collapse. Widespread famines in some far-off place certainly could have triggered migrations that, three hundred years later, ended in the Mediterranean, but it seems more likely that widespread famines would have caused immediate collapse in the area right around the volcano. 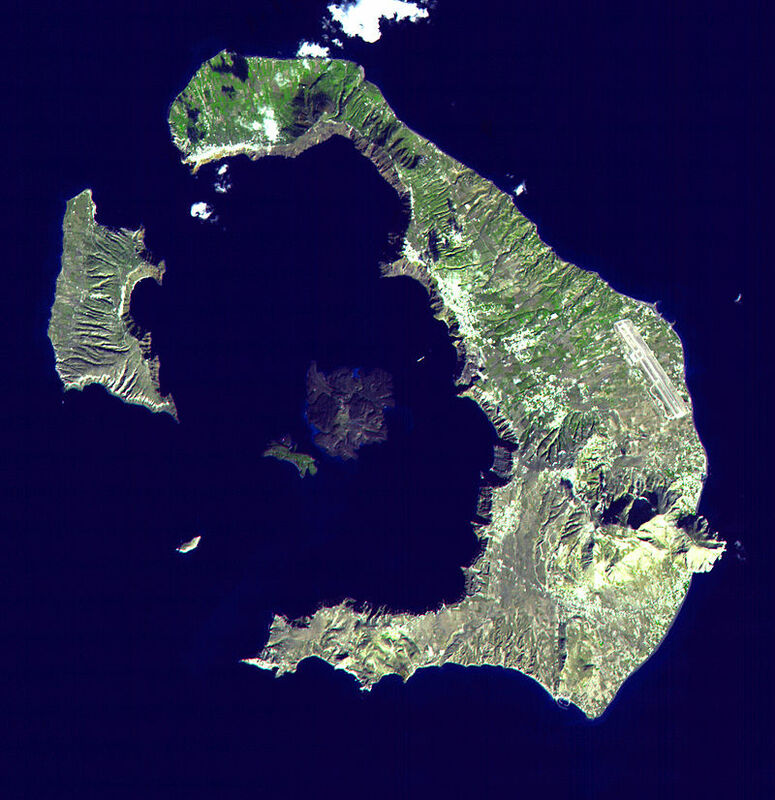 Thera might have inspired Atlantis and certainly caused some destruction on Crete, but I think it’s a stretch to blame it for events some 2-400 years later. Unless someone comes up with a bunch of evidence for a more recent eruption, I think it’s an unlikely cause. Three new military technologies “diffuse” through Europe right around the time of the Battle of Tollense and the Dorian Invasion: spoked-wheeled chariots, true swords, and cheap iron. 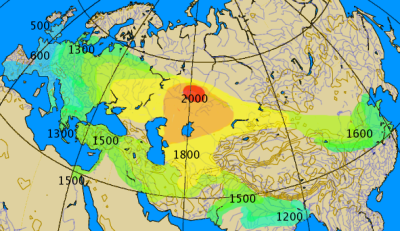 Chariots were invented out on the vast Eurasian plain around 2,000 BC, which sounds like a recipe for invasion if I ever heard one. They arrived in Anatolia and Egypt around 1500 BC, but didn’t make it to Greece and Germany until 1300 BC–just in time for an invading army to sweep through the Tollense valley or into Greece, driving a wave of displaced folks into the sea and across to Egypt. 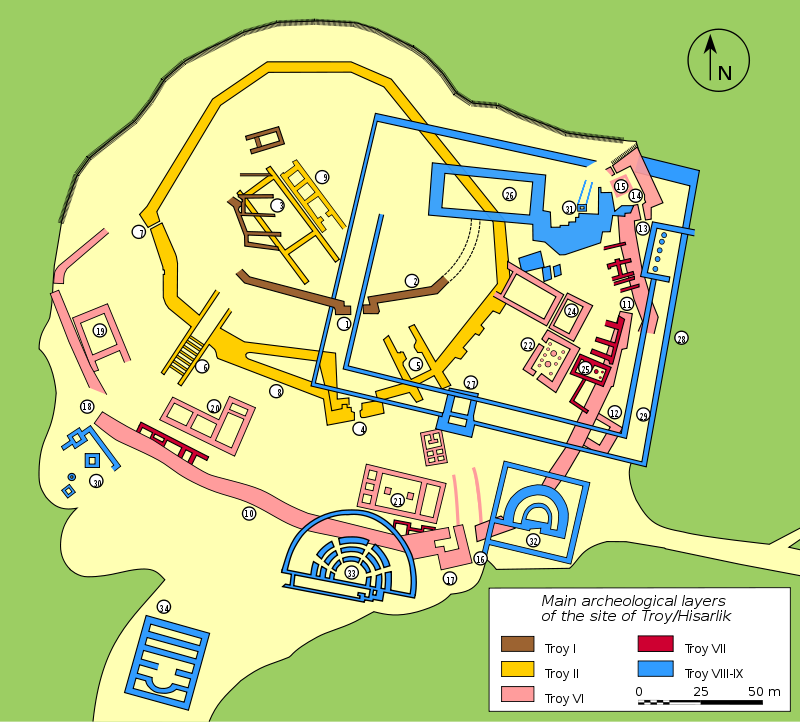 Were any chariots found in conjunction with the Tollense battlefield, or in local burials of the time? Swords, I was amazed to discover, were invented around 1600 BC in the Aegean. Before the Bronze Age, people just didn’t have materials suitable for making long blades and had to content themselves with daggers or clubs. (Sometimes clubs studded with daggers.) A new variety of sword, the Naue II, appears around 1200 BC and quickly spreads around the Mediterranean–just in time for the collapse. Early iron was, ironically, inferior to bronze. Steel will hold an excellent age, but primitive iron working did not, and early iron swords were inferior to bronze ones. But iron had several advantages over bronze: it was cheaper, required less fuel to work, and didn’t have to be mixed with tin imported from hundreds or thousands of miles away. Robert Drews argues that the appearance of massed infantry, using newly developed weapons and armor, such as cast rather than forged spearheads and long swords, a revolutionizing cut-and-thrust weapon, and javelins. The appearance of bronze foundries suggests “that mass production of bronze artifacts was suddenly important in the Aegean”. For example, Homer uses “spears” as a virtual synonym for “warriors”. Such new weaponry, in the hands of large numbers of “running skirmishers” who could swarm and cut down a chariot army and would destabilize states based upon the use of chariots by the ruling class and precipitate an abrupt social collapse as raiders began to conquer, loot and burn cities. I’m putting my money on this theory. In the days of Atys, the son of Manes, there was a great scarcity through the whole land of Lydia … So the king determined to divide the nation in half … the one to stay, the other to leave the land. … the emigrants should have his son Tyrrhenus for their leader … they went down to Smyrna, and built themselves ships … after sailing past many countries they came to Umbria … and called themselves … Tyrrhenians. Connections to the Teresh of the Merneptah Stele, which also mentions shipments of grain to the Hittite Empire to relieve famine, are logically unavoidable. Many have made them, generally proposing a coalition of seagoing migrants from Anatolia and the islands seeking relief from scarcity. Tablet RS 18.38 from Ugarit also mentions grain to the Hittites, suggesting a long period of famine, connected further, in the full theory, to drought. Barry Weiss, using the Palmer Drought Index for 35 Greek, Turkish, and Middle Eastern weather stations, showed that a drought of the kinds that persisted from January 1972 would have affected all of the sites associated with the Late Bronze Age collapse. Anatolia appears to have been fairly hard-hit by the collapse, with many cities completely abandoned and some regions not regaining their former levels of complexity for a thousand years. At any rate, whatever caused the collapse, it happened. The Dark Ages reigned, then the world recovered. The Greeks and then the Romans ruled; then Rome collapsed and the Dark Ages returned. The Dark Ages will come again. “1177 BC” by Cline is a pretty great exploration of this topic. Been a few years, but IIRC, his thesis was essentially a combination of stressors (drought and earthquakes) and systems theory (the major civilizations’ elites were so co-dependent it created the possibility of a downward spiral). This kind of feedback analysis strikes me as insightful. If an elite’s strategy is producing a surplus, they can reinvest that surplus into reinforcing their structures which can create more surplus, etc. If the context changes so that the same strategy yields losses, the elite either has to rapidly adjust their strategy or suddenly lose everything. Plus there’s a big “back the winner” psychological effect. Sorta like how it takes a while for the S&P to double but it can halve real quick. Keep in mind that at Kadesh ~80% of the men were on foot, and chariotry was still an important arm centuries after the collapse (see Battle of Qarqar), so I don’t think anti-chariot skirmishers had much to do with it. Iron weapons could’ve been a big part of the context change just by reducing costs (therefore decentralizing violence) and hurting the tin-trade profits which fed the BA civs’ structure (even before the violence cut the networks). -Do we know how the relative price of tin (in silver or gold, say) moved over this timeframe? -Was the horse-trade also important? I like your article. But I think it was the tin that was the catalyst. Tin from Afghanistan had to be taken over the mountains, probably in carts or on the backs of humans or animals. While tin from Cornwall could be loaded onto ships and sent to countries around the Med, in much larger quantities and with much greater speed. Tin was to the Bronze Age, as oil is to us today. It was a foundational economic resource that provided work, revenue and the means to enable a government to work and be productive. A sudden collapse of that market would have led to a loss of jobs, which would lead to migration, which would lead to decreased labor to farm, which would lead to hunger and famine, which would very naturally lead to civil unrest. Add to that a prolonged cold snap (think Santorini’s volcano), you have the perfect climate (pun intended) for massive numbers of starving people migrating from Europe – south. Swords do not give much of an advantage over other types of Bronze Age weapons. A spear is cheaper, easier to use and has better reach, which is why it had been the main infantry weapon until they were replaced by muskets (which also doubled as spears with the use of bayonets). Sword is more of a personal defense weapon, like a handgun. Iron might have been cheaper than bronze, but it was still quite expensive, since it still required mining, purification and other processing. A sword is also one of the most expensive weapons you can make out of any given type of metal. Because it requires a bigger lump of it to begin with, and because swords have always been difficult to make. A good sword must combine 2 conflicting requirements: a hard edge and a flexible structure. Blacksmiths had to use a variety of methods and tricks to resolve these conflicting requirements. The laborious process of making a katana wasn’t something Japanese blacksmiths did for fun, their swords wouldn’t be any good without it. The western blacksmiths stopped doing these kinds of tricks when they started working with higher quality steel that could only be made by melting iron (the Japanese didn’t have iron ore, they only had iron sand, hence lower quality steel). Iron melts at 1600 degrees versus 1000 degrees for bronze, btw. Swords are also very difficult to use in combat. They require years of training to be effective. Blade alignment is one thing to worry about. A blade will just bounce off if it doesn’t hit the target at the right angle. A sword is not good for hacking, it doesn’t have enough weight for that. It’s only good for slashing and sometimes thrusting. If you don’t have the right training, you are at risk of hurting yourself when trying to use a sword. So it wasn’t at all the case that swords “democratized” violence, like kalashnikovs of Antiquity. On the contrary, you had to be a professional warrior to use one, and be of high status to be able to afford one. And I don’t think they changed anything in military tech. They were more of a sign of the rise of a new type of ruling elite: the professional military class (plunder-cracy, as I’d like to call it). Another point. Regarding the “peaceful Bronze Age”. The way I got it is that the scientists thought of the Bronze Age as relatively peaceful because there is simply far far fewer historical and archeological signs of any carnage. So if large scale organized violence did happen in the Bronze Age, it still was of significantly lesser intensity and less common than in the Iron Age. Or at least it seems this way. 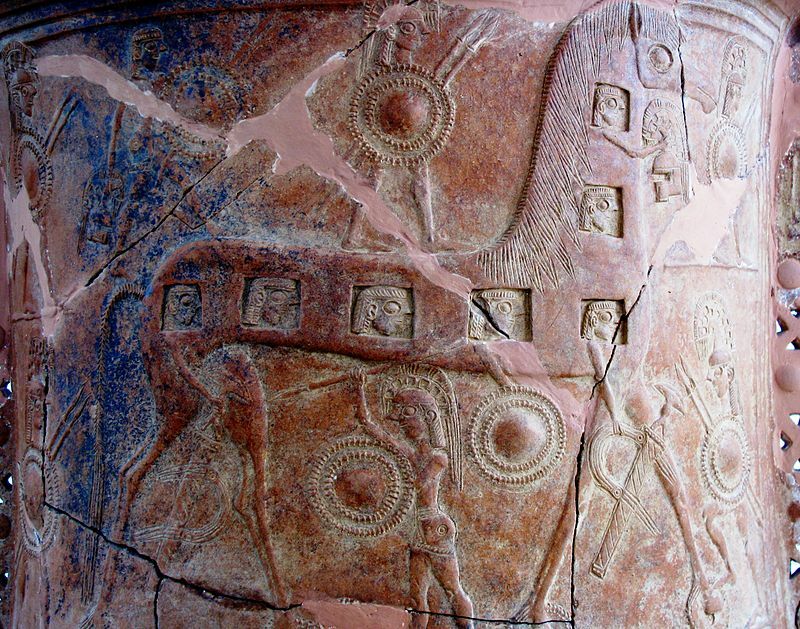 The battle of 1250 BC wasn’t necessarily typical of the Bronze Age. It could be more of a taste of things to come. Interesting points. Thank you. Yes, I agree that the relatively small point on the tip of a wooden stick (spear) is easier and cheaper to make. Good swords were luxury items, like the expensive samurai swords still made in Japan.